After all that washing and polishing it was going to be a late start to the day. However one of us was up early and came to wake me at 7.30am for the usual Sunday morning phone call back to dear old mum in Perth, Western Australia. It was damned hard getting out of bed and I almost toppled over once on my feet. The brain thinks I’m still 26 but the body refuses to acknowledge! The first maintenance task of the day was to check the tension on the belt of the larger alternator. Jan can hear an intermittent “ticking” or “clicking” sound when the engine is idling. She heard the same sound when it was gradually failing last time. There doesn’t appear to be any sign of wear on the belt but if I peer under the alternator when the engine is running the belt appears to ‘flap around’. I’ve tightened it up for the third time which appears to have both reduced the “flapping” and the “ticking”. We will both continue to monitor it. Jan can do the listening and I’ll do the looking! I wanted to make a start on fitting the extra cleats we purchased at the Crick Show. The centre anchor point on the roof isn’t in the middle of the boat and neither are the cleats. 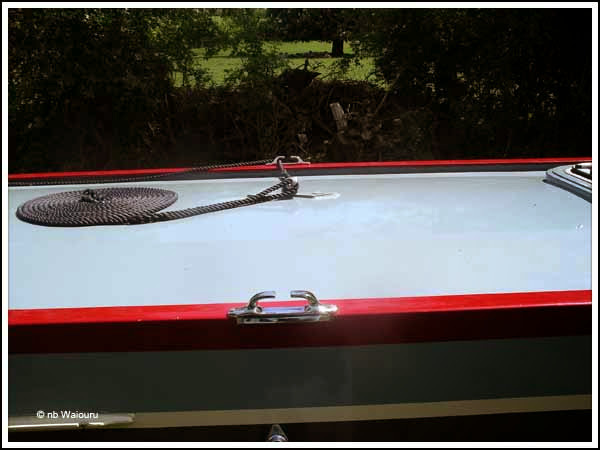 Jan has been finding it hard to pull the boat in using the centre lines so the plan is to fit a second set of cleats on the roof handrail at the mid point of the boat. After carefully measuring and marking the mid point of the roof the three holes in the cleat were marked on the handrail using an ink pen. As I don’t have a centre punch to score the centre of each hole I carefully used a 1.5mm drill bit to start each of the three holes. This actually proved to be quite difficult as the boat was moving backwards and forwards with the passing of boats. The plan was to enlarge the pilot hole with 4.5mm bit. This would then be threaded with a 5mm tap. The two assessed risks were the snapping of the 1.5mm bit or the 5mm Tap. I only have one Tap so this part of the task would be critical. To my surprise the hole had to be drilled all the way into the steel. 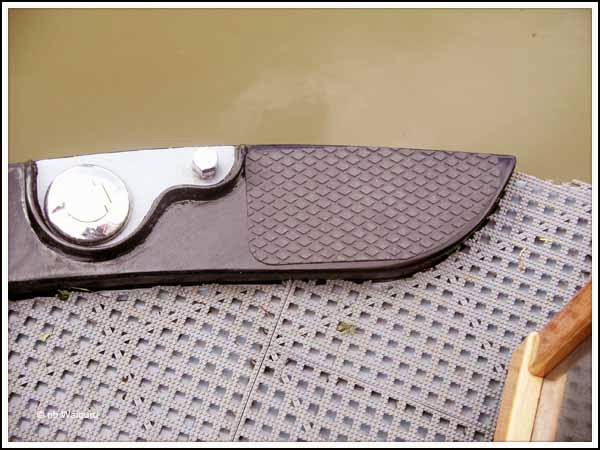 I had expected the hole to penetrate through the steel shell of the boat. 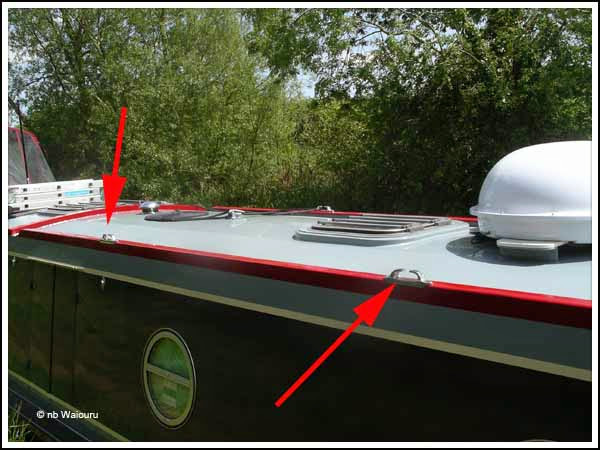 The first two holes were completed without incident but as the third hole was almost finished the 4.5mm bit snapped almost flush with the surface of the handrail (probably due to the boat moving). This was a catastrophe! The hole couldn’t be tapped with the remains of the bit inside the hole and the cleat wouldn’t fit with the bit in the hole. Eventually I removed half the broken bit with a pair of pliers and was able to use the 5mm Tap to thread the top half of the hole. Construction adhesive was applied to the underside of the cleat and down the threaded holes. 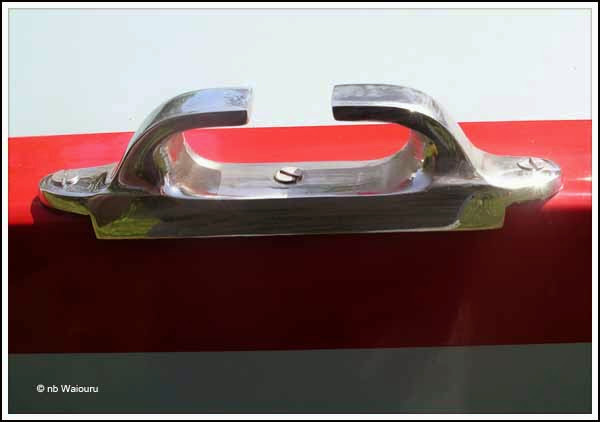 The cleat was then secured using 5mm SS machine screws. Now we need to buy a replacement 4.5mm drill bit before attempting to fit the cleat on the opposite side. A rest was needed and as we were sitting inside a couple of towpath walkers stopped and then introduced themselves as blog readers. They were John & Sally (nb Gerbera) and were out for their Sunday morning 3 mile walk. Gerbera was moored back towards Walford Junction. Two sets of blog readers in two days…… We’re spoilt! Lovely to meet you John & Sally! The last task for the day was to fit half the non-slip pads that were purchased at Crick to the stern deck gunwale. Jan has been concerned about her footing when boarding and alighting so we’re having non-slip pads on the gunwales at the bow and stern. It’s going the be a light dinner tonight. A can of alphabet spaghetti (cheap can from somewhere) on toast with a cheese & ham topping. The plan tomorrow is to go down the Foxton Flight of locks and then visit both the museum and remains of the incline plane. A pub lunch a Foxton before cruising to Market Harborough in the afternoon. If it is any consolation, after we had a new alternator belt fitted at the end of last year, (which had also snapped unexpectedly), I have had to re-adjust the new belt 3 times since. I am hoping it is just down to the new belt stretching in use, and will now settle down. I just hope ours is an adjustment issue and nothing more serious! Tom, does/did the boat not pull in to the side equally front and back then? I would have thought that the best place for "even pulling" would have been the centre point of the water line, as it is likely to be the resistance of the water which determines how it pulls in. Of course, there are other factors such as the shape of the bow and stern which cold affect things. All I'm saying is the the centre point of the roof might not necessarily be the best place for the cleats/fairleads. To determine the best place you could place a helper (Jan) on the bank, position the boat roughly parallel to the bank and a few feet out, get on the roof yourself, and hold the line in different positions while Jan pulls. I fear it might be too late, though! It's now too late to experiment on another location for the cleats. I should have used the same thought process you have suggested! Drill sizes for tapping metric threads.